MY BRIGADISTA YEAR by Katherine Paterson (Candlewick, October 2017) Yes, that Katherine Paterson, who wrote Bridge to Terabithia! Candlewick sent me an ARC of her latest, set in Cuba in 1961. Of course, as always, the Don and I are committed to giving an honest review, no strings attached. When thirteen-year-old Lora tells her parents that she wants to join Premier Castro's army of young literacy teachers, her mother screeches to high heaven, and her father roars like a lion. Lora has barely been outside of Havana -- why would she throw away her life in a remote shack with no electricity, sleeping on a hammock in somebody's kitchen? But Lora is stubborn: didn't her parents teach her to share what she has with someone in need? Surprisingly, Lora's abuela takes her side, even as she makes Lora promise to come home if things get too hard. But how will Lora know for sure when that time has come? Shining light on a little-known moment in history, Katherine Paterson traces a young teen's coming-of-age journey from a sheltered life to a singular mission: teaching fellow Cubans of all ages to read and write, while helping with the work of their daily lives and sharing the dangers posed by counterrevolutionaries hiding in the hills nearby. Inspired by true accounts, the novel includes an author's note and a timeline of Cuban history. "Ai-ee!" In all my thirteen years, I hadn't heard a screech like that since the time I accidentally stepped on the cat's tail. But now it was my own mama's voice, shrieking to high heaven." I am totally into stories told in different cultures and different time periods and it's Katherine Paterson, people!!! (I admit to sobbing during Bridge to Terabithia.) This story is not as heartbreaking (what could be, right?) but there are certainly moments of peril and times when you'll get a lump in the throat. Lora is an idealist, and the opportunity to be a brigadista--teaching the campesinos to read and write--is not one she can pass up. I loved the relationships that developed between her and the family she was living with, as well as the very honest way she expressed her fears. There is violence off the page--several people on both sides are killed. It was obviously a very troubled time for Cuba. I have seen comments on Facebook denigrating the book as pro-Communist. (The anti-Cuban government lobby in the U.S. is very strong.) In Katherine Patterson's defense, I would have to say that she has chosen a period when idealism was at its height after the corruption of the Bautista regime. She mentions in an author's note that there were abuses by Castro. What comes through strongly is a young person's perspective to do good in the world by helping others. Katherine Paterson is the author of more than 30 books, including 16 novels for children and young people. 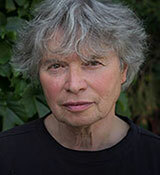 She has twice won the Newbery Medal, for Bridge to Terabithia in 1978 and Jacob Have I Loved in 1981. The Master Puppeteer won the National Book Award in 1977 and The Great Gilly Hopkins won the National Book Award in 1979 and was also a Newbery Honor Book. For the body of her work she received the Hans Christian Andersen Award in 1998, the Astrid Lindgren Memorial Award in 2006, and in 2000 was named a Living Legend by the Library of Congress. The date of publication makes it a classic, although I'd not heard of the series until this book was listed for this year's Oregon Battle of the Books. 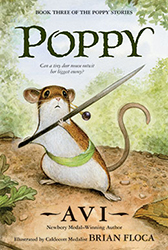 There are six books in the "Poppy series" and this is the second one. "At the very edge of Dimwood Forest stands an old charred oak. A great horned owl, Mr. Ocax, waits there. With his piercing gaze, he surveys the lands he calls his own, watching for the creatures he considers his subjects. None dares disobey him, until the night a courageous deer mouse named Poppy boldly defies him, only to find herself in terrible danger. To lead her family to a better life, will Poppy battle Mr. Ocax to the end? "A thin crescent moon, high in the sky, shed faint white light over Dimwood Forest. Stars glowed. Breezes full of ripe summer fragrance floated over nearby meadow and hill. Dimwood itself, veiled in darkness, lay utterly still. At the very edge of this forest stood an old charred oak on which sat a great horned owl. The owl's name was Mr. Ocax, and he looked like death himself." What an ominous start! (The sort of start the Don likes very much!) Mr. Ocax is a terrifying villain, and the novel continues with the owl preying on two mice, Poppy and Ragweed. I have to say that the opening scenes would be hard for a tender-hearted child reader! I have been reading a number of animal stories lately, and have to say that a cast of animal characters gives an author latitude, particularly in creating villains. A human villain deserves some complexity (and a villain is never really a villain to him/herself.) Mr. Ocax, on the other hand, is pretty unrelentingly evil. I read this aloud with my 5th-grader, and it was a grand read-aloud. There's a lot of dialogue and many opportunities to unleash one's inner actor and do different voices. I particularly enjoyed doing the pompous father, Lugwort, and the loquacious porcupine, Ereth. (And Ereth has his own book later in the series.) I would certainly read another in this series. High on the enjoyment level! Poppy was adventurous and quite thrilling. There wasn't a lot of comedy. Poppy was brave and Mr. Ocax was horrifying. My favorite character was George the cat. Avi is one of the greats. You can learn more about him on his website. His explanation about how he came about to write the Poppy books is interesting.